Compressed Towels - 12-Pack | BUDK.com - Knives & Swords At The Lowest Prices! 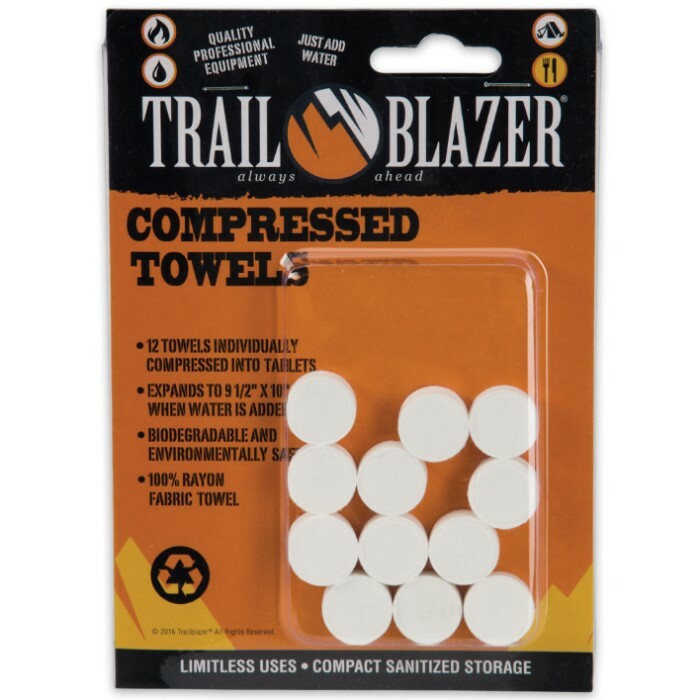 The perfect addition to your camping or emergency pack, this 12-pack of compressed towels allows you to carry multiple towels without taking up valuable space. 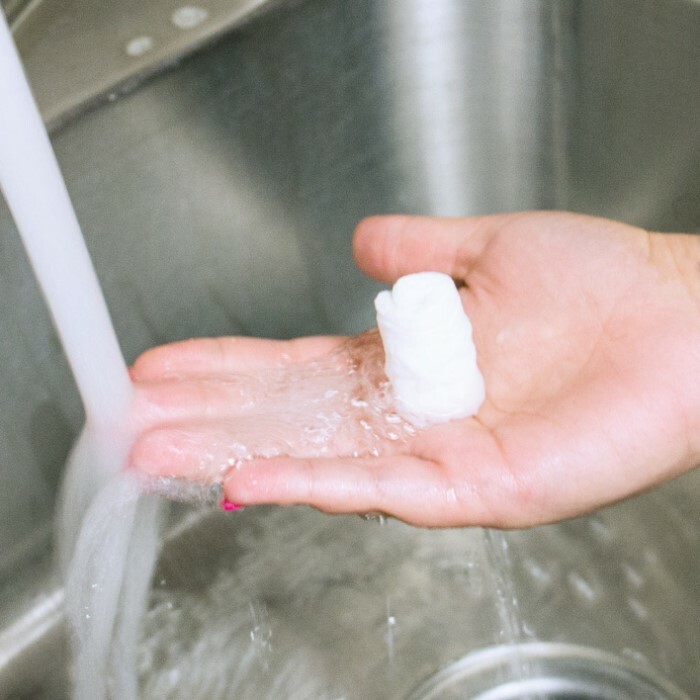 Each towel is compressed into a small 3/4" tablet and when water is added, it expands into a 9 1/2" x 10" hand-e-towl. At a price this cheap, you can afford a 12-pack for your toolbox, camping back, emergency bin and everything else! The towels last far longer than I thought they would. I use these for my emergency preparedness packages that are going to be used for barter if ever needed. They don't expire and can be stored in the cellophane that each is individually wrapped in for decades. When they are needed, they will be there for us or for whomever we barter with. Great item and can be reused many times if not treated roughly. Great for cleaning up after a long day out in the wilderness or clean up from a disaster. I pair these up with anti bacterial clean up type tear open squeeze packets. I read the reviews and ordered 100 of these for hygiene kits I was putting together to take to an orphanage in Haiti. I received them promptly but realized that they are not as sturdy as I expected. 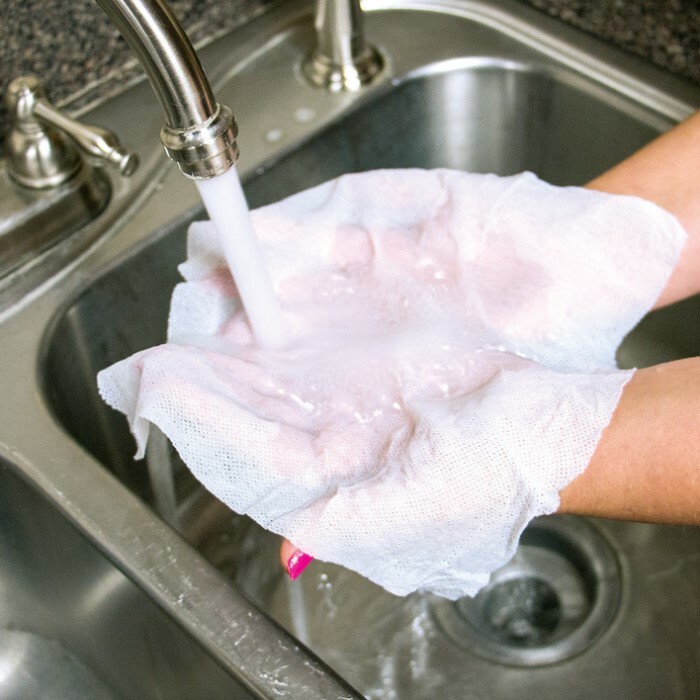 They are more of a small, lighweight handi-wipe than a washcloth and I can see being able to use it once or twice, but wouldn't imagine they would last for more than that. They are so tiny - really the size of a quarter, that I can see they would be handy to take hiking or camping, but did not really work for what I needed. These things are great for go-bags, backpacking, and camping. They are tiny, it's nothing to toss a couple in a backpack and have a small but sturdy reusable towel for hygiene or chores. Pair them with a small bottle of hand sanitizer and you've got quick hand cleanup out in the field if you need to dress a wound or prepare food. They are also individually wrapped in cellophane like candy (They come in a larger resealable bag) so they can be divided up out of the larger bag and still stay clean until needed. OK, I have purchased these a number of times because you can use the and reuse them at home for GREEN cleaning. They are great for roughing it because they are the size of half dollars and blow up to smallish hand towel size that can be used for clean ups in restrooms or campsites, rinsed well, and reused. Value for price, necessity. Value per weight- well they weigh- like nothing. They take up no room in your pack. They are inexpensive and re- useable. Get a few sets. You will buy more and tell fellow campers. A Must. These are widely available because they are infinitely useful. Like I said, you can get them anywhere but Bud K had a great price at the time I ordered other stuff and anyone can have a use for these. In the car, the boat, the RV, baby bag, Bug Out Bag, First-Aid Kit - Purse - Locker at School....you get it. Now Get some!! was skeptical at first, but these are great, they pick up, and I have even dried and reused them, untold uses! I love these towels. They are extremely compact to fit into all the go bags for my family. I have 32 towels in total to be split, and they are always there when I need them for emergencies. With Hygiene being a very important lesson to be taught to my children, they find these fun, and exciting to work with. Thanks BudK for providing the way yet again. These are great little towels for backpacking,small durable and very handy !